Sensory tubs are wonderful for children to play with. They offer opportunities to explore sights, sounds, smells and textures, and promote lots of imaginary play and language development. :: the tub itself. You’ll want something large enough to hold your materials, but shallow enough so your child can easily reach inside. I usually use this under-the-bed storage box, which is just right. :: a base material. 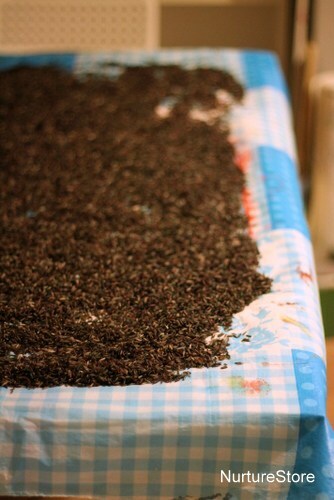 We’re using rice today, but you could use shredded brown paper, dyed pasta, or real compost for your tub. Give it a good shake, until all the rice is coated in the colouring. Then spread it out to dry. I set mine out on a tablecloth and left it overnight – and in the morning discovered the children had already started playing with it, drawing shapes and letters in the rice. :: Added extras. Try to include a variety of open-ended materials, in different colours, shapes, sizes or textures. 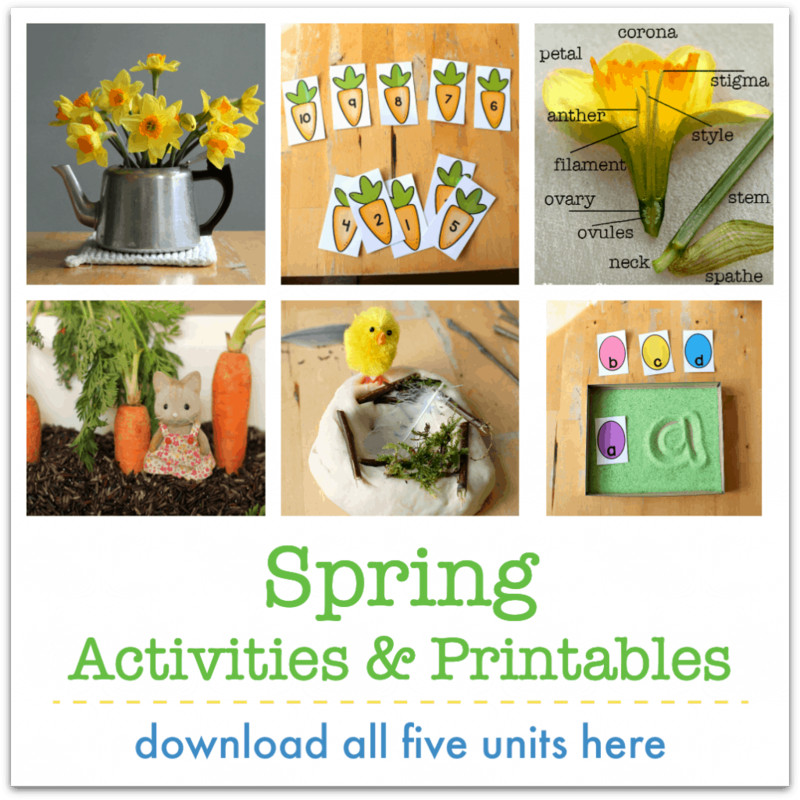 These extra materials can give the children a spark of an idea, and they can use them to explore the tub or start some imaginary play. 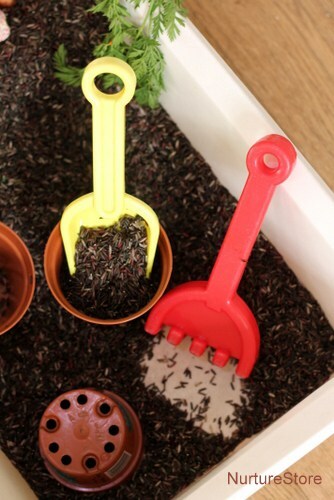 Today we have some little spades, rakes, and plant pots. These are great for scooping, pouring and filling. 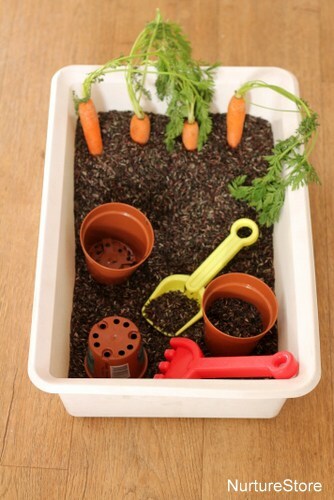 Or perhaps for some pretend gardening. We also have some real carrots, looking fantastic with their feathery leaves still on. These bring another, natural texture to the sensory tub, and are fun to plant and pull out of the ground. And finally, a few little characters are always popular with my children, and very often are a spark for storytelling and puppet shows. How old are your little ones? I feel like my 1 yo would love to play in something like this! Love the coloured rice- how do you get the brown for soli? Hi Jennie. I mixed red and green food colouring gels to make the brown. 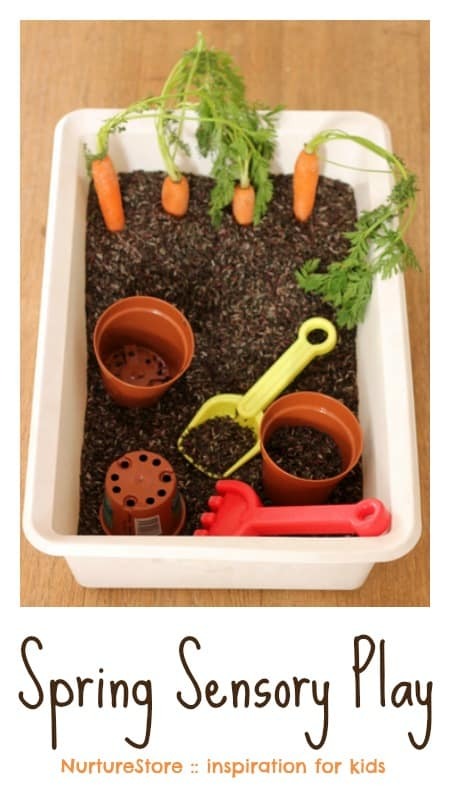 This looks great, always looking for new ideas, I just let my little one have soil to play with…bad mum :O To be fair he absolutely loves it lol! Debbie, my daughter loves to play with soil too. Nothing bad mum about that! Hi Awel. 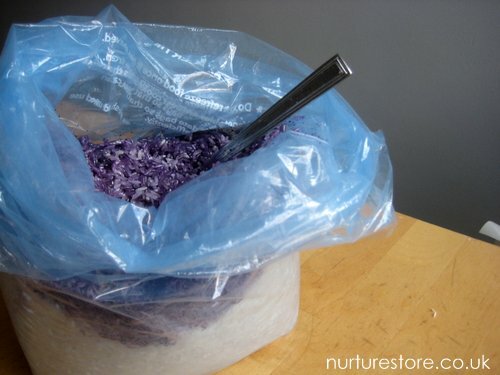 Sensory tubs are wonderful for children to explore using all their senses. They can use them for imaginative play, storytelling and language development too. This one is really easy to make. 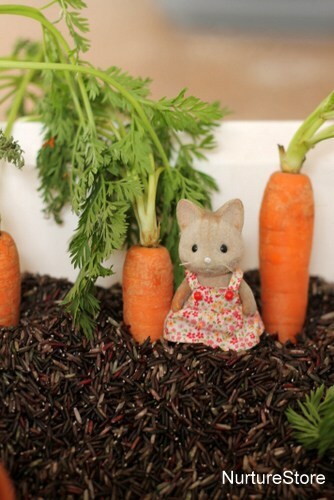 Hi, I love this and want to do it for my daughter’s Peter Rabbit themed birthday party. I’m not sure if this is a silly question or not… do you cooked the rice? Hi Raylene. What a lovely theme for a birthday party! No, don’t cook the rice.